Small business loans in Southwest Washington are on the rise as businesses seek more financial support for expansion. “We have experienced a steady increase in lending both locally and nationally,” said Tawnie Nelson, Wells Fargo senior vice president and director of small business banking for Southwest Washington and Oregon. Small businesses have taken out more loans to replace or purchase equipment; increase inventory; and acquire additional working capital to support growth, said Nelson. Banks and credit unions are growing their small business divisions to support Vancouver’s restaurants, breweries and growing tech scene. U.S. Bank has also increased its interest in small businesses – nationally and in Southwest Washington – and now is one of the top Small Business Administration (SBA) lenders in the area. Small business owners may consult these specialized bankers about payment collection, checking accounts or about how to get a real estate loan, for example. In 2015, U.S. bank gave 298 SBA loans ($44.8 million total) to small businesses in the Portland and Southwest Washington area combined, up 8.8 percent from 2014. The majority of these loans funded small ticket items (under $250,000) including equipment, vehicles and lines of credit for business expansion projects. But beyond the small ticket area, the amount of other loans U.S. Bank gave – like startup financing – remained flat, said Curtis. Low interest rates on SBA 7A loans have also contributed to an increase in business expansions. The current maximum interest rate ranges from 5.75 to 8.25 percent, depending on the size of the loan and the amount borrowed. Most startups must look for non-traditional financing – through a funding platform like Kickstarter or private funding, for example – until they reach a point in their business cycle with a financial track record, said Kim Capeloto, executive VP at Vancouver-based Riverview Community Bank. However, because small community banks or credit unions have a vested interest in their communities, they often come up with preferential rates and alternative ways to help startups, said Capeloto. “When a [startup] business comes in with a great idea and want to borrow $100,000, but there’s no track record and they’re in the infancy of development, we might be able to lend them something against [the owner’s] home,” said Capeloto. Whether they receive an initial loan from a bank or receive financing elsewhere, it’s important that new small businesses join financial institutions sooner than later. “You’re going to need a checking account for your business anyway, so start cultivating that relationship early on,” said Capeloto. Many banks help guide small business owners through their finances on an on-going basis. “Small business owners need to have all of their resources available, whether it’s a good certified public accountant (CPA), a good banker or a good business plan,” said Curtis. In 2014, Wells Fargo launched Wells Fargo Works for Small Business, which lets business owners create or update business plans before meeting with a banker. Wells Fargo’s Business Credit Center helps explain what a bank looks at when making credit decisions and how to build a strong credit application for the lender. U.S. Bank recently launched its small business portal, U.S. Bank Connect, and Edge, a suite of small business credit cards designed to help merchant processing and manage expenses. 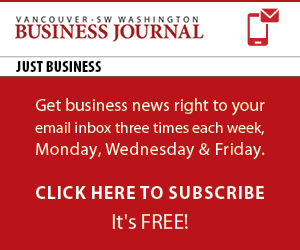 Besides educational tools, many Southwest Washington banks refer business owners to the Vancouver Chamber of Commerce or the Washington Small Business Development Center, for example, to provide marketing and other advice outside of a bank’s expertise. “Banks want their customers to be successful, so they have the ability to pay back the money lent to them and contribute to the local economy,” said Capeloto. “We anticipate that [small business] growth will continue, but it depends on the regional economy, in addition to the national economy,” added Capeloto. Interest rates, dictated by the economy, won’t stay low for much longer. So business owners may need to act now on any financing they’re considering, according to finance industry experts. Even if a small business owner has the cash to buy equipment or make an investment, he or she may want to consider taking out a loan at a low interest rate now and set aside the cash for cushion, said Capeloto.